So some of you might have seen this recipe AGES ago (okay, not that long ago, but at least a week ago) on my Facebook page. It’s not that I forgot about it (they’re so yummy, I couldn’t forget even if I tried), but that I got distracted with other things. Also, I’ve been writing. A lot. How much is a lot? Well, in a post I wrote on October 5th, I wrote about how I had hit 87,000 words. Exactly two weeks from that day, I have now written roughly 108,000 words. That’s about 21,000 words in a 2 week span time. I’m not sure about how quickly other writers write, but after being blocked for so long, it was such a pleasure to finally know where the story was going, and to start seeing where things would end. In other words, I can see the light! I’m actually at a point where taking a break is hard, because the end is near and I’m so excited to meet it. It’s bad though, because I’ve been putting off so many things over the past 2 weeks, but finding time to do them is kind of chore. Originally I had set my deadline as December, but after this week, I’m aiming for this weekend (if my family let’s me write that is…) or early next week. That is if nothing else distracts me! 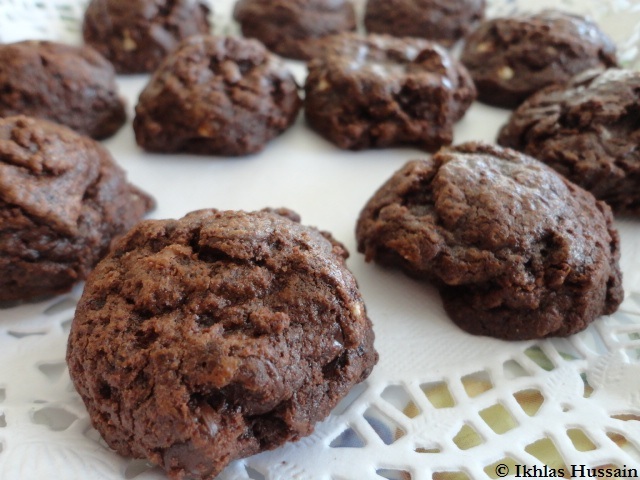 Obviously baking isn’t a distraction, because then how else would I discover these sinfully delicious cookies, which need to be eaten by every chocoholic out there. Mix together dry ingredients together (flour, cocoa powder, baking powder, and salt) in a small bowl. Set it aside. Unwrap your chocolate squares and melt in the microwave at 30 second intervals, until the mixture is smooth. Be careful not to burn the chocolate. Set it aside. In another small bowl, whisk eggs, and then add vanilla. Set it aside. Beat butter first, and then add both brown and granulated sugar. Add in the egg mixture and mix well. Keeping your mixer on, add the melted chocolate and keep beating until well mixed. 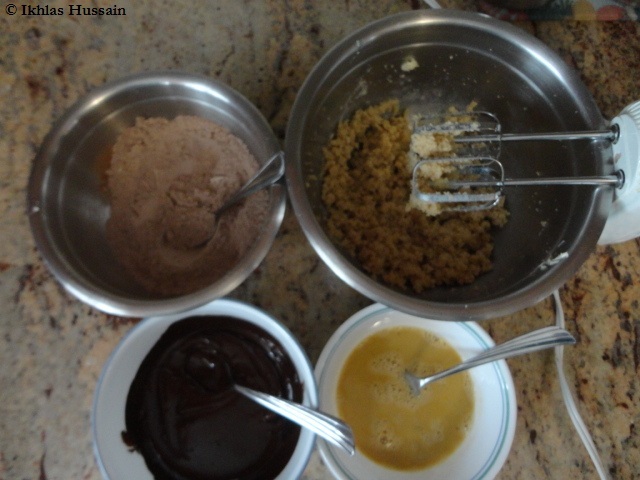 Then, add dry ingredients slowly, mixing well after each addition, and then add the chocolate chips. Do not overmix the dough. Chill the dough in the fridge for at least 30 minutes, and then scoop out dough and set on a parchment-lined cookie sheet. Bake in a preheated oven at 350 degrees F for 10 minutes. The centers will be rather soft, but they will finish cooking on the baking sheet. If a brownie and a chocolate chip cookie were to get married, this would be the child. Seriously, they are SO GOOD. 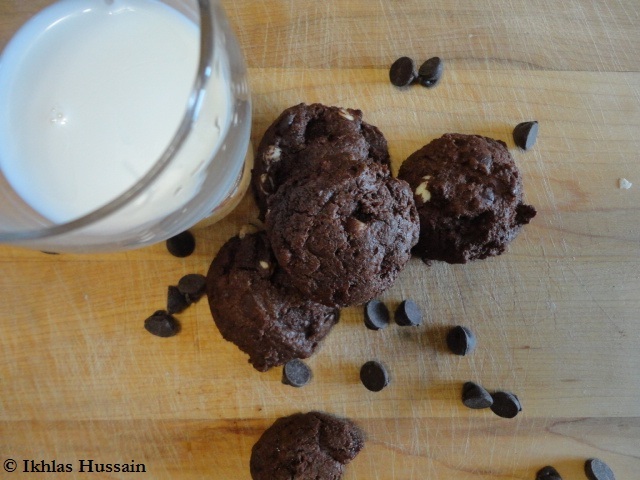 Served with an ice-cold glass of milk, they’re as dense and moist as brownies, but still super soft and studded with melted chocolate chips. 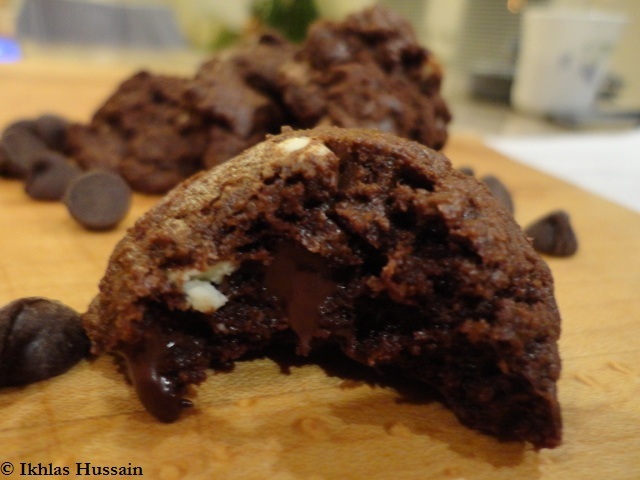 The combination of cocoa powder and semi-sweet chocolate make these a chocolate explosion in your mouth. And don’t even get me started on the dough… You won’t be able to stop at one! 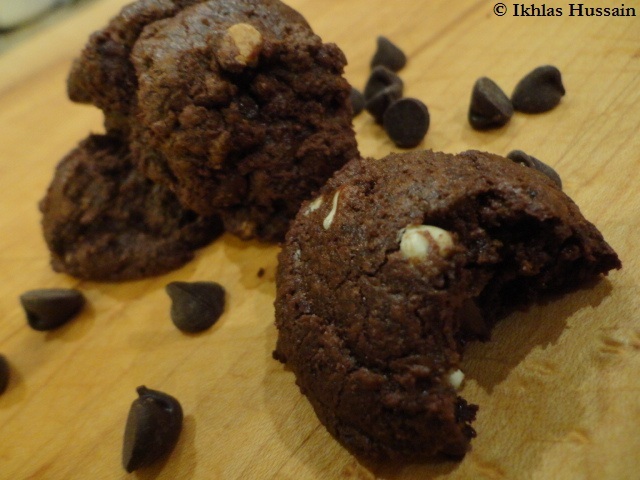 So my cookies look rather brownie-like in these pictures, since I overmixed the dough (do not do this!). Also, if you want to maintain their soft, ooey-gooey nature, do not overbake. It’s hard to tell when these are done, since the dough is already so dark, so do take them out after 10 to 12 minutes, depending on your oven. Assalamu Aleikum, these look so (infinite o’s) amazing!